Dave Bakken, 43, figures if he wasn’t wearing sunglasses, he might be missing an eye. “It was just a freak thing,” Bakken said about the errant puck that connected with his right eye on Friday, Jan. 21, the opening day of the U.S. Pond Hockey Championships on Minneapolis’ Lake Nokomis. “Nobody did anything. On Sunday, Bakken still was sporting a nasty black welt underneath his eye. By then, though, the 43-year-old St. Paul Como Park boys hockey coach had other concerns. Such as his legs. And his lungs. And most every other body part. Bakken had just played his fifth game of the day, the intensity ratcheting up by the hour as the 32-team, single-elimination championship round headed toward its thrilling conclusion. Although disappointed by the title-game loss, and thoroughly worn out from all those high-intensity games (Wright Homes played nine in all over the tournament’s three days) Bakken still was able to reflect on the overall experience. 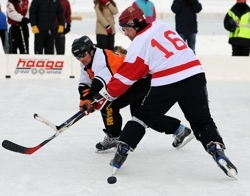 Bakken, along with 40-year-old Curt Wright, has been a mainstay on the Wright Homes team that has won three U.S. Pond Hockey Championships titles. For years, they also have been regulars on what is generally considered the Twin Cities’ top men’s league team. 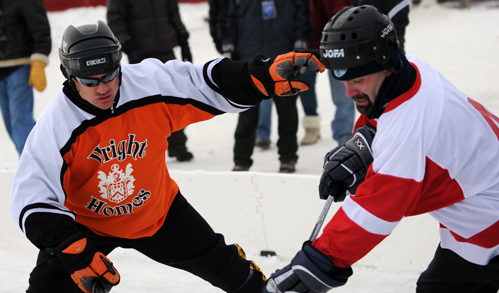 Formerly known as Buck’s Unpainted Furniture, Wright Homes is a collection of former Division I and pro players that regularly competes in – and wins – the USA Hockey National Senior Elite Hockey Tournament. The group skates on Thursday nights at the St. Thomas Ice Arena in Mendota Heights, where former NHL players can get their competitive fix and the level of play is miles beyond that of normal pick-up hockey. 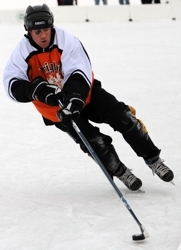 Despite squaring off against players half his age, Bakken’s rink savvy and ability to play suffocating defense makes him one of the best players on any ice surface – artificial or pond. Skilled, smart, strong, competitive -- all of those adjectives tagged to Bakken were evident even in Wright Homes’ loss to the Whiskey Bandits. Among the 200 or so fans watching the championship game were some of Bakken’s Como Park players and their parents. Asked if his players might have gained a newfound respect for their coach after watching him in the title game, Bakken, who has been playing high-level adult league hockey form more than 20 years, said he wasn’t sure that would be the case. “Hopefully I don’t go to practice and have them tell me what I did wrong,” Bakken said with a laugh. In his first season as the Cougars’ head coach, Bakken, who played at Williams College in Williamstown, Mass., has guided Como Park to a 4-12-0 record through Jan. 26. So, too, is the pond hockey. Bakken said he and Wright choose the “Almost 40” portion of their team’s name back when they were, as the name says, almost 40. “And now it is six years later and now we are over 40,” Bakken said. And, other than the occasional bump, bruise and black eye, still among the masters of the pond.